So by this time, if you have read the first two blogs, you have been made aware of the life insurance industry’s downward spiral. Prior to our self-discovery, we wanted to blame everyone else because that was the easy solution. But now, we have found ‘our cause’ and there is no blame being shifted. We discovered that for ExamOne to do their part in helping the trend shift back upwards, we need to put an emphasis on the applicant and focus on what satisfies them. Somewhere along the way we lost our nerve. We thought that people didn’t want to talk about their mortality. We were afraid. We were afraid that they were afraid. What is the biggest mistake most sales people make? You know the answer: not asking for the business. Of course, life insurance is not as glamorous as buying something such as the new iPad. Getting the iPad, practicing with it, telling our friends about the apps we downloaded and what a deal we got seems like good conversation. Who doesn’t want to talk about that? Getting “fitted” for life insurance sure doesn’t sizzle like conversation about the iPad, but what a difference it makes! What a selfless act. How awesome is that? What if it was worth telling everyone that I just bought a million dollar life insurance policy so my family will be secure if something happens to me? Let’s do it. I can imagine getting a virtual high-five from people I don’t even know. I might even set a record for “likes” on Facebook for being so forward thinking. A few years ago at ExamOne, we went through an exercise to discover what business we were really in at that time. It was during this period of self-discovery that we learned to ask ourselves better questions. We were going to question ourselves harder than our clients were questioning us. It became clear that what we had been doing, while by most measures had been quite successful, there was a deeper connection that our already passionate team wanted. We were attempting to discover what Simon Sinek calls our ‘Why,’ before we even knew there was a book or lecture series about it. We simply called it ‘Our Cause’. We were going to be the most passionate company in our space, but with a new emphasis on the applicant. Like the old adage, if mama is happy, everyone is happy, we soon discovered if the applicant is happy, everyone is happy. We were forced to examine every aspect of our company, every dollar we were spending, every meeting we were having. It was not easy, but it was our dedicated ExamOne family all lining up to be committed to the person that was acting the most selflessly in our whole supply chain, the Applicant. Fast forward a few years. As I finish blogging on a flight to an industry outing that I have attended for 20 straight years, we are now a company totally committed to improving the applicant experience and reducing the amount of time it takes to help a family feel secure in case the unthinkable happens. 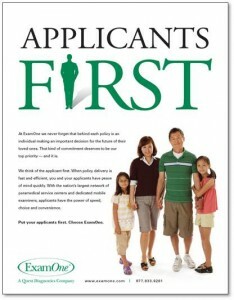 We put our applicants first with every decision we make, or new idea we discuss. Every day we strive to be more like the applicants we serve. Our energized company full of innovators is bringing these advances to the market. This changes applicant lives, and consequently the lives of our employees and the communities in which they live. We are simply committed to doing our part where we believe in the greater good, serving our applicants and one another through the life insurance industry. ExamOne has been given a gift of a unique place in the life insurance buying process and we are more committed than ever before to do our part. Is it easy to chase down applicants, as well as serve the underwriters and agents at the same time? No. Do we question ourselves, do we push the envelope, do we make mistakes—the answer to all of those is definitely, yes. Will it be on our watch that we did our very best to celebrate the applicant and their awesome decision to purchase life insurance? Yes! So how do we make this an upward trend again? Let’s make the next 60 years the best our industry has ever seen. Troy currently serves as President of ExamOne. He joined ExamOne as Vice President, Paramedical Operations in October 1999, where revenues grew from $6M annually to more than $125M annually. Prior to joining ExamOne, Troy served in leadership roles with multiple insurance industry service providers including IMR (Insurance Medical Reporter), PMI (Physical Measurements Inc.) and PSA (Paramedical Services of America). Troy earned his Bachelor of Arts degree in Mass Communication from Baker University in Baldwin, KS and his Master’s degree in Speech Communication from Central Missouri State University. When he is not working, he enjoys skiing and fly-fishing with his wife and twin sons. Previous post: State of the Life Insurance Industry: Where have all our applicants gone? 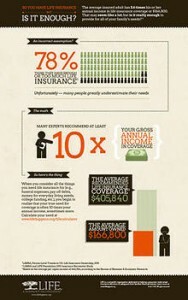 Next post: Life Insurance Awareness Month: Are you doing your part to create awareness?